Top Guns documents the triumphs and heartaches of Arsenal Football Club during the 1990’s, the most successful decade in modern times for one of Europe’s top clubs. Several of Arsenal’s major personalities speak openly in the book. Anders Limpar and Alan Smith tell the stories behind George Graham’s early ’90’s successes. Bruce Rioch speaks for the first time about his bizarre sacking in 1996. 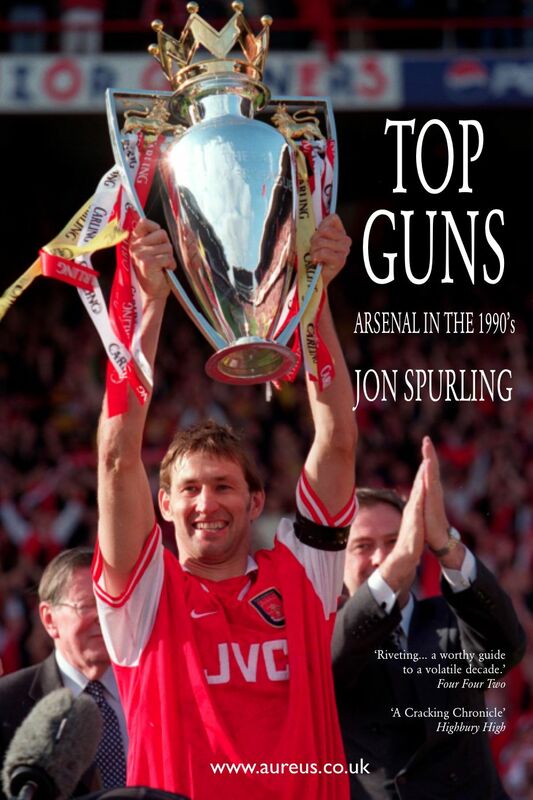 Top Guns is an indispensable guide to the drama and controversy surrounding 1990’s Arsenal, covering the 1991 title triumph, the Graham sacking and the Double of 1998. Those ten years were the most thrilling and turbulent in the club’s history. Fans were treated to a cascade of silverware, and watched the scoring exploits of the club’s most prolific striker – Ian Wright. The Gunners’ greatest post war talent – Dennis Bergkamp, helped to push the team’s style of play onto a higher plane and captain Tony Adams marshalled a defence whose longevity defies belief. But as Arsenal charged headlong into the digital age, so the Taylor report, the Graham affair, the Bond Scheme and the impact of Sky T.V. strained many fans’ relationship with the club. Heroic deeds on the pitch combined with upheaval behind the scenes; it was to be the story of Arsenal in the ’90s. This is Jon Spurling’s second book. His first book All Guns Blazing – Arsenal in the 1980’s has been equalled with hard-hitting and gritty narrative.